Interview with Patty Schemel for Magnet magazine. Lita Ford is the undisputed Queen of Heavy Metal, and after reading her long-awaited autobiography, Living Like a Runaway, I can say one thing’s for certain: Heavy lies the crown. I had the honor of writing this Lita Ford interview for Decibel‘s blog. I’d been chasing Neko Case for years—literally—in order to interview her for Decibel magazine’s closet metalheads column. Finally, on Freddie Mercury’s birthday, we had a chance to speak. The column itself is not online; you have to get a copy of Issue #136 (February 2016) to read it. But the remnants of our conversation can be found on the blog. Check it out. Horns way the hell up. The Rezillos’s first album in 37 years, Zero, is one of the greatest punk rock albums of 2015. Punk rock is an attitude, an aesthetic. It’s not something you grow out of, nor is it something only accessible to young people. Punk doesn’t die with age or time. Fay Fife and Eugene Reynolds are proof: Zero is a rollicking good time. Here’s my Rezillos interview for Noisey. Pretty sure this is what big-shot writers refer to as a career highlight. 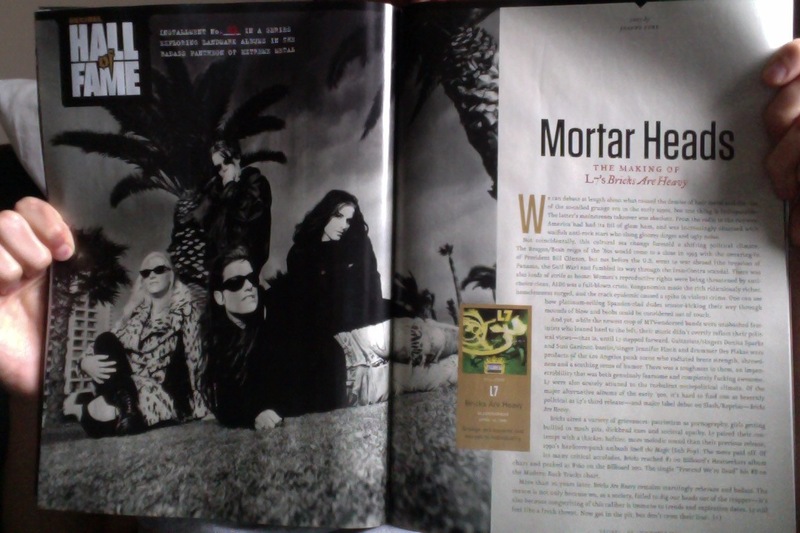 I had the very enormous honor of interviewing the members of L7—Donita Sparks, Suzi Gardner, Dee Plakas, and Jennifer Finch—about their 1992 album Bricks Are Heavy for Decibel’s Hall of Fame series. L7 is one of my all-time favorite bands, and Bricks Are Heavy is one of my all-time favorite albums. I sort of obsessed over this piece, even though L7 kinda did all the work. You can read my intro here, but to read the interviews—all 5,500 words of them—you need to order a copy of the November issue of Decibel. It’s worth it. I’ve read the piece dozens of times (literally), and I will return to it again and again for sheer inspiration.